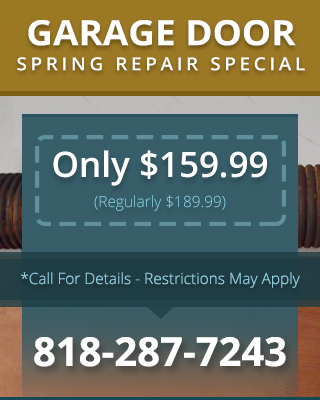 Getting regular garage door maintenance Woodland Hills CA can help prevent and repair lots of common issues. For example, our skilled technicians can tighten up loose cables and hinges to fix noisy doors, or repair sluggish doors by cleaning the garage door opener. They can also prevent future problems from developing. For example, they could replace a worn garage door spring before it breaks in order to save you from possibly burning out your garage door opener trying to lift the door on a broken spring. Any major problems discovered during the maintenance visit will be brought to your attention immediately. We’ll help you weigh the pros and cons of repair versus replacement and choose a course of action you’re comfortable with. We are strong believers in safety here at Carroll Garage Doors both for our employees and for your family. In order to keep you safe, every maintenance visit includes an inspection of the safety features on your garage door. Sensors can become misaligned and reversing motors can wear out, leaving you and your loved ones vulnerable to a garage door accident. If you want to keep your garage door working properly and avoid accidents and other nasty surprises, investing in our preventative maintenance services should be very helpful.